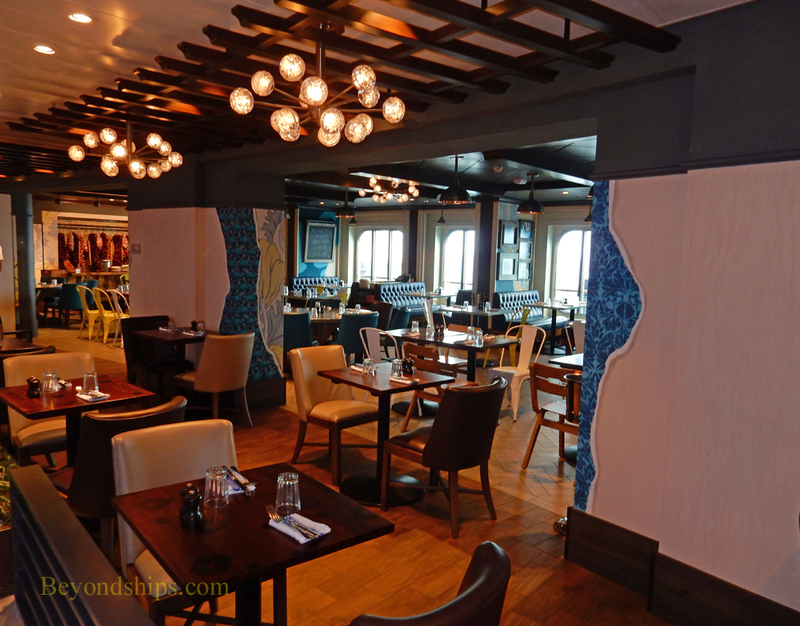 Jamie's Italian is a relatively new addition to Royal Caribbean's line-up of specialty restaurants. 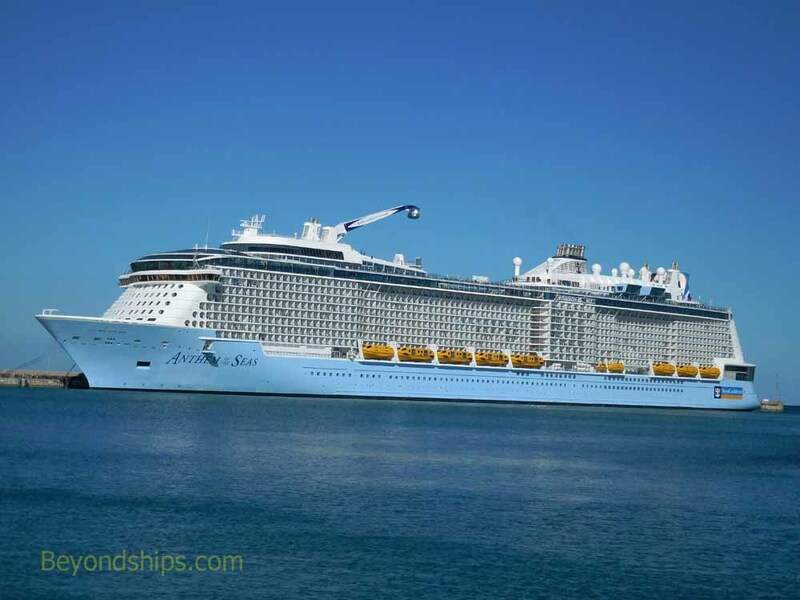 It premiered on Quantum of the Seas and has been continued on Anthem. It was developed in conjunction with British celebrity chef Jamie Oliver. This restaurant was a big hit when Quantum entered service. On sailings from Quantum's original homeport in New Jersey, it was difficult to get into Jamie's. Therefore, I was surprised to find that when Anthem began sailing from Southampton, there always seemed to be empty seats. A British guest explained that Chef Oliver has more than 30 Jamie's Italian restaurants around Britain and since travelers usually prefer to dine in places that they do not have access to at home, seagoing Jamie's was not of great interest to them. Whatever the reason for the slow start on Anthem, now that the ship is sailing from Bayonne, Jamie's is a busy place. Moreover, I did not meet anyone who had been to Jamie's who did not like it. The restaurant is located on the port side of Deck Five towards the back of the ship. One side is completely open to The Via, the promenade that runs through this part of Deck Five. The dining area is decorated like a cross between a market and an Italian kitchen. Thus, it is a casual atmosphere. It may see unusual to find that the driving force behind a successful Italian restaurant is a British chef. However, Chef Oliver began preparing Italian cuisine early in his career. An advocate of using fresh ingredients, Chef Oliver's success underscores that he has a flare for this cuisine. And that flare comes through in the Jamie's Italian on Anthem of the Seas. Many of the dishes have familiar names such as baked lasagne and aubergine (eggplant) parmigiana. However, the freshness and the use of contrasting ingredients really enhance the flavor of these old favorites. You can also taste the freshness in the pastas. Crab spaghetti with capers, fennel, chilli and anchovies has great personality. The pasta dishes can be ordered as a main course or, in a smaller portion, as a starter or side dish. Also of note was the baked salmon filet. Tender yet not undercooked. Many guests order a plank as a starter. These are arrays of either vegetables or meats which come along with cheeses, olives, chilli jam, and other items. They are called planks because they are served on planks. There are long planks for sharing by larger parties and also more individual size planks. It is a fun variation on traditional antipasto.